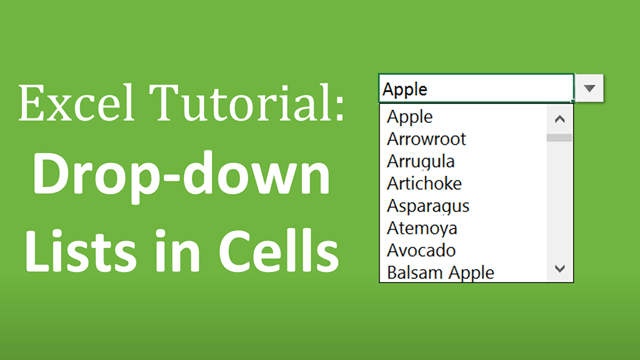 Bottom Line: The complete Excel guide on how to create drop-down lists in cells (data validation lists). Includes keyboard shortcuts to select items, copying drop-downs to other cells, handling invalid inputs, updating lists with new items, and more. What Are Data Validation Lists? Creating a drop-down list is a great way to ensure that entries are uniform and free from spelling errors. It also helps restrict entries so that only values you’ve approved make it onto the sheet. That’s why they are also called data validation lists. They help to make sure that only valid data makes it into the cells that you’ve applied it to. This can be helpful when multiple users are entering data on the same sheet and you want the options to be limited to a list of items or values that you’ve already approved. We can also use drop-down lists to create interactive reports and financial models, where results change when the user changes a cell’s value. To create a drop-down list, start by going to the Data tab on the Ribbon and click the Data Validation button. The Data Validation window will appear. The keyboard shortcut to open the Data Validation window is Alt, A, V, V.
You’ll want to select List in the drop-down menu under Allow. 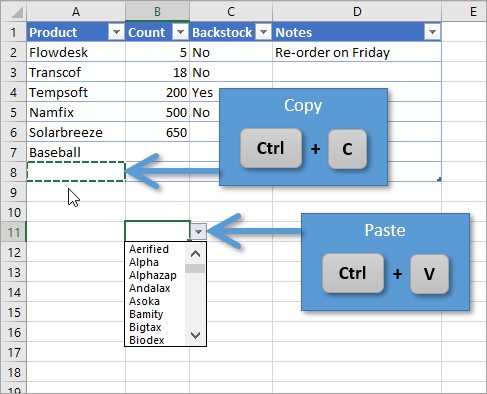 At this point there are a few ways that you can tell Excel what items you want to include in your drop-down list. The first way is by typing all of the options that you want in your drop-down list, separated by commas, into the Source field. For example, if there are only two options to choose from, such as Yes and No, you would simply type “Yes, No” (do not include the quotation marks) in the Source box. It doesn’t matter whether a space follows your comma or not. A longer list of options might look like this: “Red, Blue, Green, Purple, Orange, Yellow, Brown”. The options in your drop-down list will appear in the exact same order that you have typed them. Note: On some language versions of Excel you will need to use a semicolon (;) instead of a comma. The second way to fill your list with options is to choose them from a range of values. To do this, instead of typing values into the Source field, you want to select the icon to the right. Selecting this icon will open up a small window that will auto-fill when you select a range of cells on the worksheet. Once you've selected the values you want to appear in your drop-down list, you can click on the corresponding icon to take you back to the Data Validation window. At this point, the range you've selected will show in the Source box and you can just hit OK.
Now the values in the range that you've selected show as options that you can choose from in your drop-down list. To choose the option you want from your drop-down list, you can use your mouse to click on the option you want. Another way to select it is to use the keyboard shortcut Alt+?. This brings up the drop-down list and you can use your up and down arrow keys to highlight the selection you want, and then press Enter to select. Note: You will create a free account for the Excel Campus Members site to access the download and any future updates. The download site also contains installation instructions and videos. 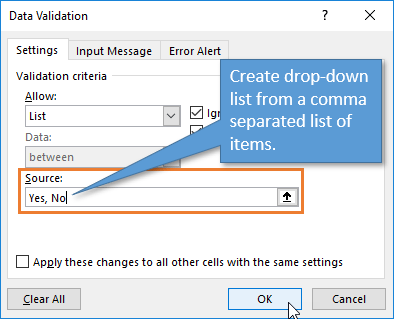 If you have created a drop-down list for a particular cell and would like other cells to have the same data validation list, you can easily copy (extend) that list to other cells. 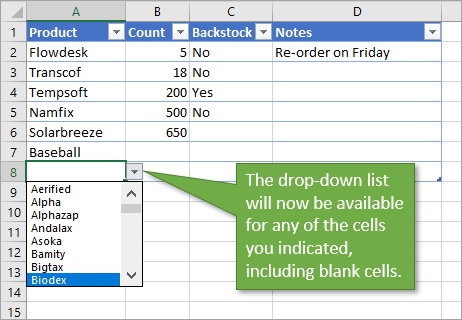 Start by clicking on the cell that has the list, and then select any additional cells that you want to extend the drop-down list to. This can include blank cells or cells that already have values in them. Choose Yes, and then hit OK when the Data Validation Window appears. You'll see that each of the cells in your selection now has the same drop-down options as the original cell. 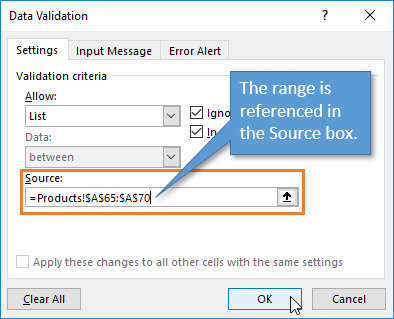 It's also worth noting that you can copy and paste Data Validation from one cell to another just as you would copy and paste normal values and formatting. What happens when we enter a value into a cell that has a Data Validation List, but that value is not one of the options in the list? That depends on the Error Alert settings, which we have control of. To change the kind of message the user receives when they enter an extraneous value, you can go back to the Data Validation window. Under the Error Alert tab, you can find three options: Stop, Warning, and Information. You’ll also notice that there are fields where you can change the title of the error message and the text of the message itself, so that when the user enters data that’s not part of your validation list, they will receive an alert that’s worded in the way you want it to appear. The Warning style displays a message that gives the user a choice to allow an entry that isn’t on the preset list. The Information style displays a message that automatically allows the entry no matter what the value is. The user is presented with informative text about validation rules. 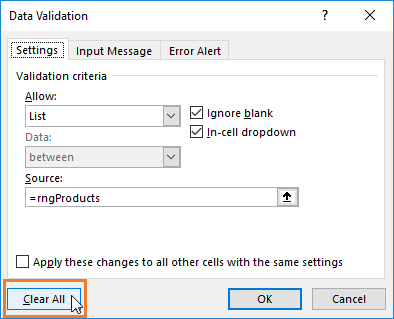 When any invalid entry is made in a cell, the error checking alert will appear in the cell. The error is indicated with the green triangle in the top-left corner of the cell. 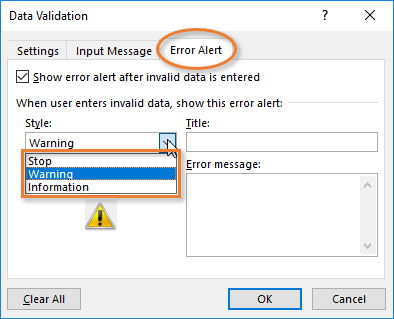 Clicking the Error Box button will allow you to see more info about data validation error. You can select “Display Type Information” from the list to see the cause of the error. 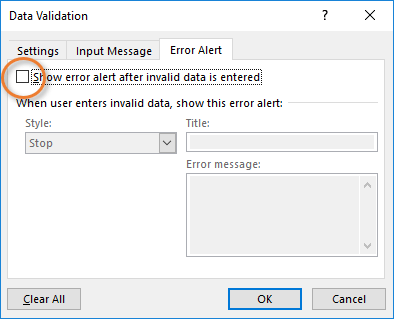 Another option under the Error Alert tab is to uncheck the box that says, “Show error alert after invalid data is entered.” This allows any value to be entered into the cell, and no message box will appear. 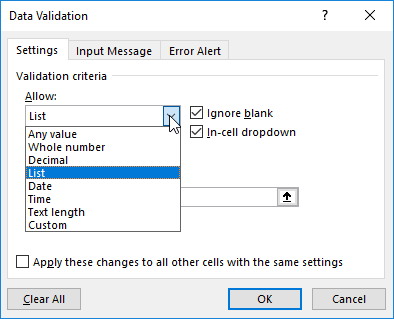 The great thing is that we don't have to redefine these settings for each cell that has Data Validation. The “Apply these changes to all other cells with the same settings” checkbox does this for us. When you click the checkbox, the other cells will selected in the background. This gives you a visual indication of what will be updated. 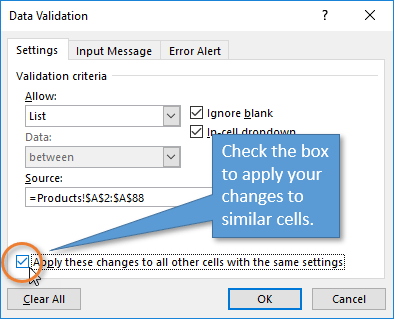 Then press OK. Any cells that shared the same data validation settings will now include the updated changes that you’ve made. Getting rid of a Data Validation list is simple. Open the Data Validation window and click the Clear All button. 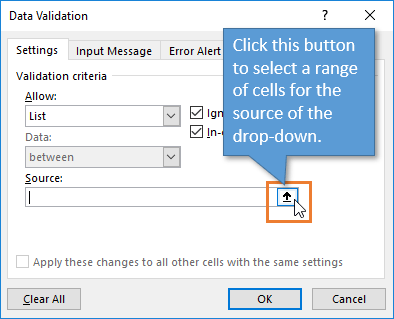 If you want to clear the validation settings from other cells with the same settings, make sure to click that checkbox before hitting the Clear All button. 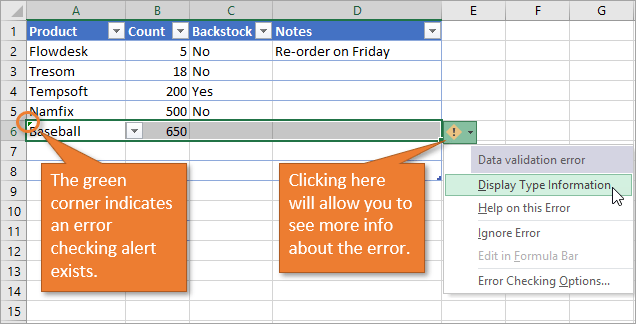 Data Validation lists are a great tool to add to your Excel toolbelt. 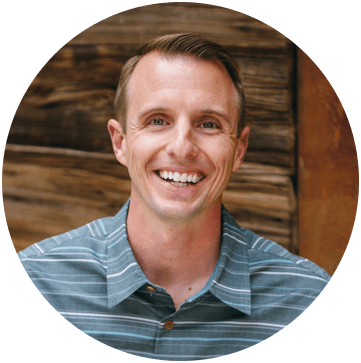 They help us keep our data clean and make our spreadsheets easier to use. We can use them as the source of lookup formulas to create interactive financial models and reports. I will do some follow-up posts with these techniques as well. Once you feel comfortable with drop-down lists, you may want to try dependent (also called cascading) lists. These are lists that change depending on what you've already chosen in another list. 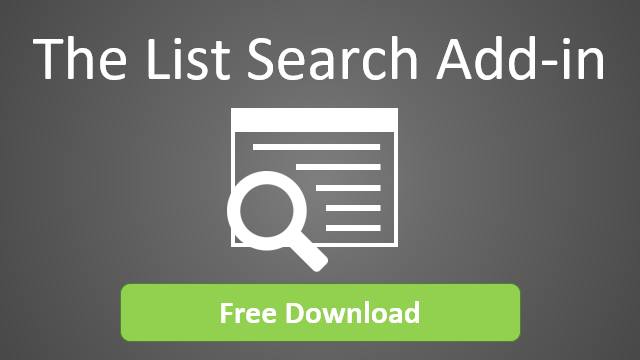 For example, you may create a list of car brands, like Toyota, Ford, and Honda. Then you can have a second list of car models that populates with specific options depending on what you choose in the first list. If you choose Toyota in the first list, you might see Corolla, Camry, and Tacoma in the second. But if you go back to the first list and choose Ford, the options in the second list can change to Mustang, Explorer, and Focus. Learn how to create dependent cascading lists here. Great , it is helpful . You are a gift to humanity and God will continue to pave way for you.Thank you so much I have learn a lot from your free excelcampus. Thanks, Jon. The keyboard shortcuts info was particularly useful. Look forward to your name ranges video.